Happy Holidays, friends! I hope you’ve all been able to spend some quality time with friends, family and loved ones this season. 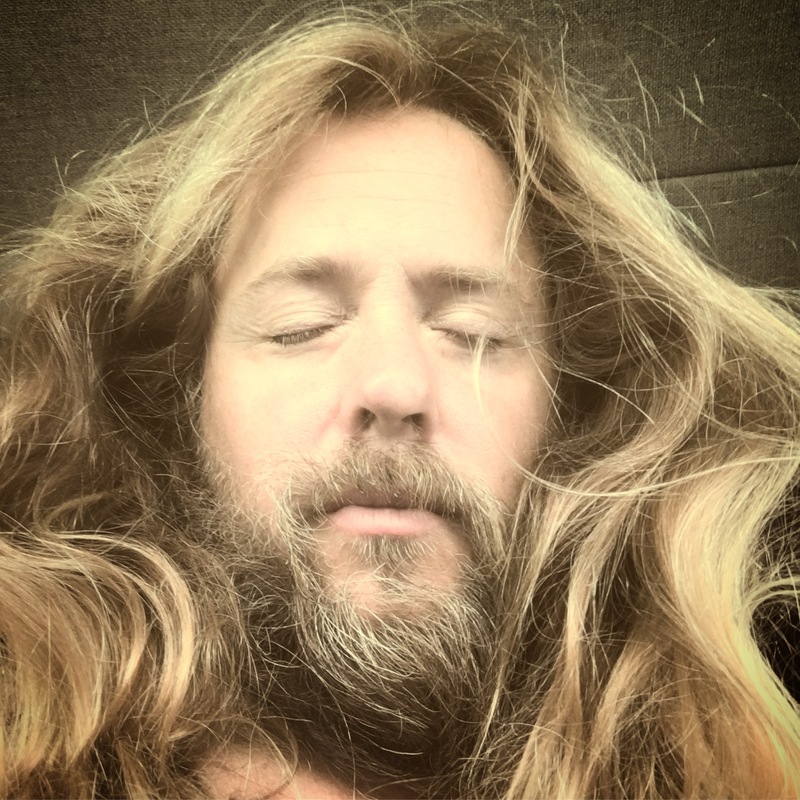 It’s been a hectic time for me since Thanksgiving traveling from California to Tennessee and back again for recording, gigs, and more. After wrapping up some vocals and a few more edits and overdubs on my upcoming 2018 release recorded and produced by Grammy Award winner, Richie Biggs, in Nashville, Tennessee, I headed out to Vail, Colorado to pick up a residency for a few weeks at one of my favorite little clubs I’ve ever played. I had a blast entertaining folks over the course of 3-4 nights per week while making turns during the days and eating some of the most delicious Mexican food (yes, Vail has it) anywhere. 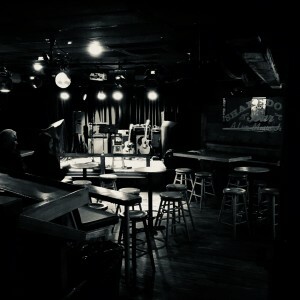 All set up and ready to rock after sound check before doors open at Shakedown Bar in Vail, CO during my residency. 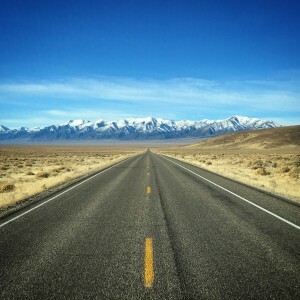 I was able to reconnect with my family for the Christmas holiday and really enjoyed spending a few days with them before packing up the Outside Van again and heading farther west along Highway 50, the “Loneliest Road in the Country”, to Lake Tahoe, California to kick off my ski country gigs for the winter season on December 27th. At the time of this post, I’ve been playing every single day since I’ve arrived and… So far, so good! 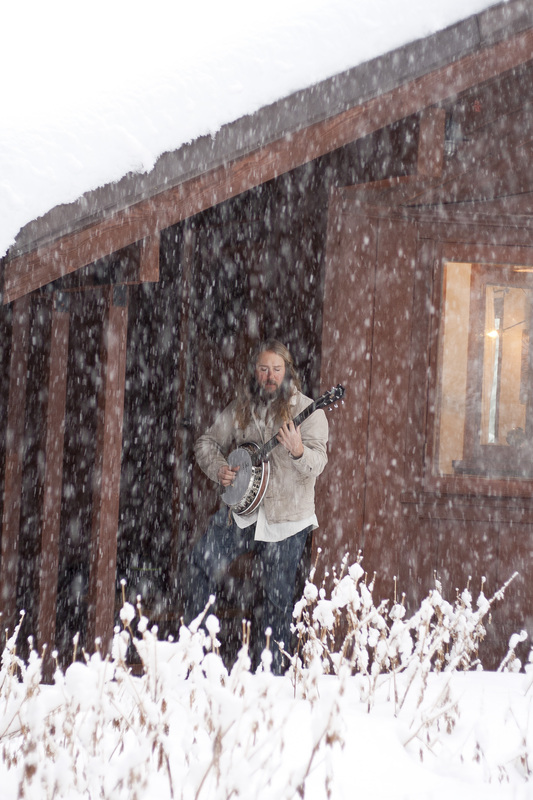 There hasn’t been a ton of snow out here, but the gigs have been keeping me busy. In the quieter moments, I still feel a gentle tug at my heart to get back out on the highway, but it also feels pretty cozy to know that I’ll be in one place for a little while with minimal driving in-between performances and some time to catch up on writing and, well… rest! 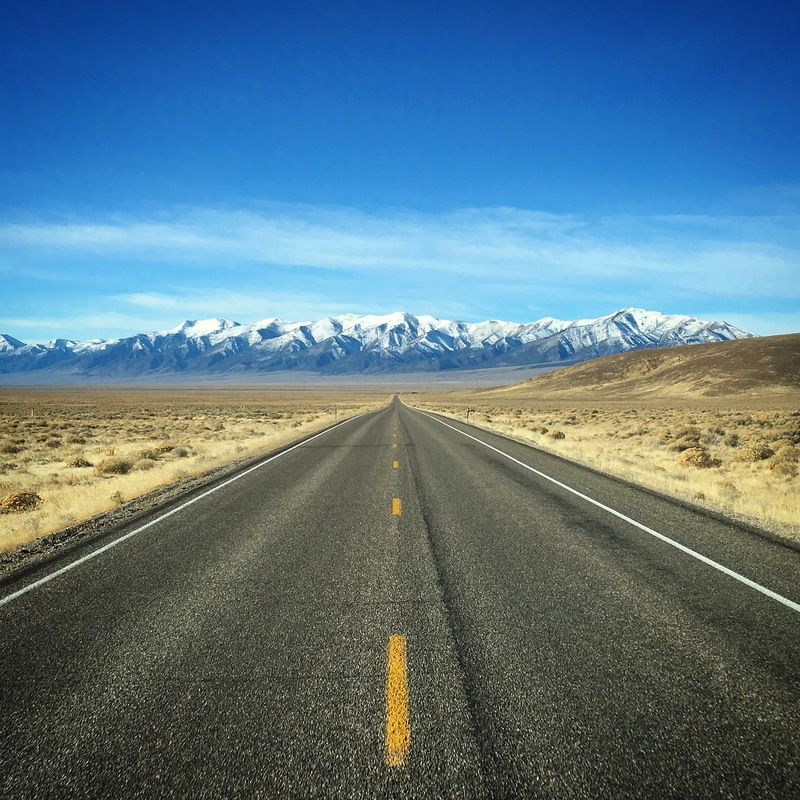 The open road in Nevada… Highway 50, also known as the “Loneliest Road in the Country”, is just plain mesmerizing! 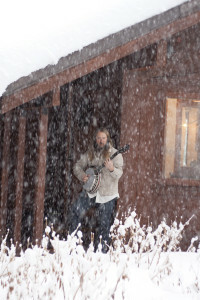 If you plan to be around the North Lake Tahoe region this winter, be sure to keep your eyes trained on my performance calendar and c’mon out for a song or two when ya can! I’d love to see you, trade stories, share some music, and make some turns with you! Until then, best wishes for a wonderful, happy, healthy, and prosperous new year to you all! I look forward to more adventures with you guys in 2018! I’ve had a few days off on the road and took the opportunity to drive down to Spring Valley, CA to visit with the folks from Deering Banjo Co. to pick up my Boston 6-String (pictured below), which got a brand new neck after an unfortunate incident earlier this fall, mid-gig. The replacement neck is awesome and the instrument is back to it’s old self – maybe even better! 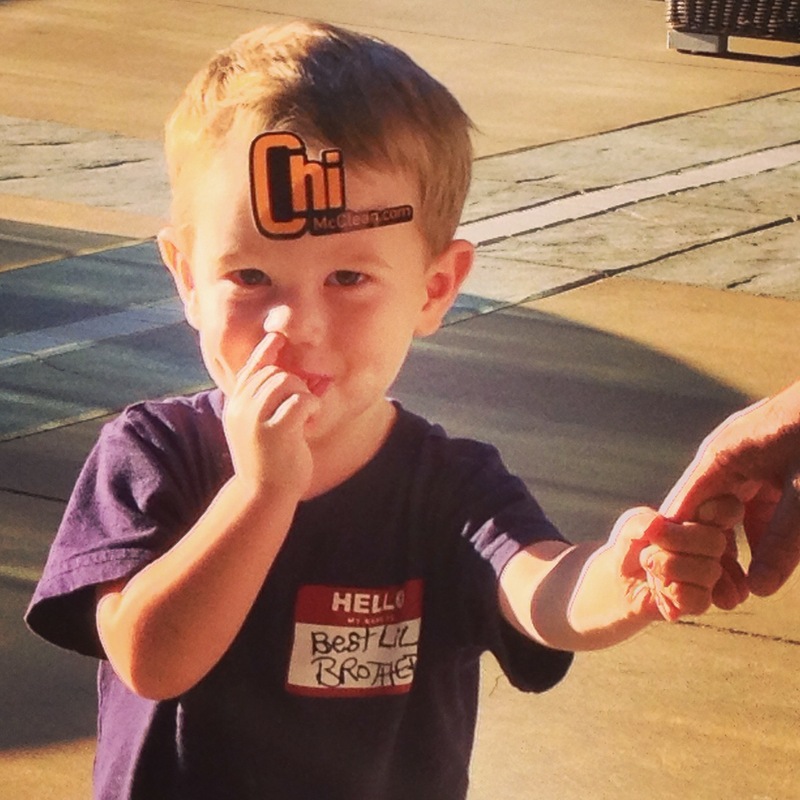 Big thanks to repair tech, Sam Miller, for giving it a little extra love. It really plays and sounds like new! 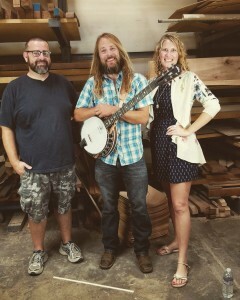 Sharing a few laughs with Chad Kopotic and Jamie Deering in the Wood Room at Deering Banjo Co. after filming some performances. 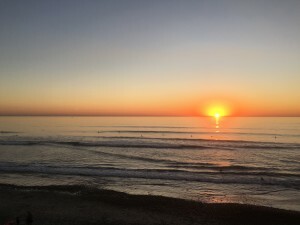 A picture perfect sunset in Carlsbad, CA after a fun day of music and meetings in the greater San Diego area. 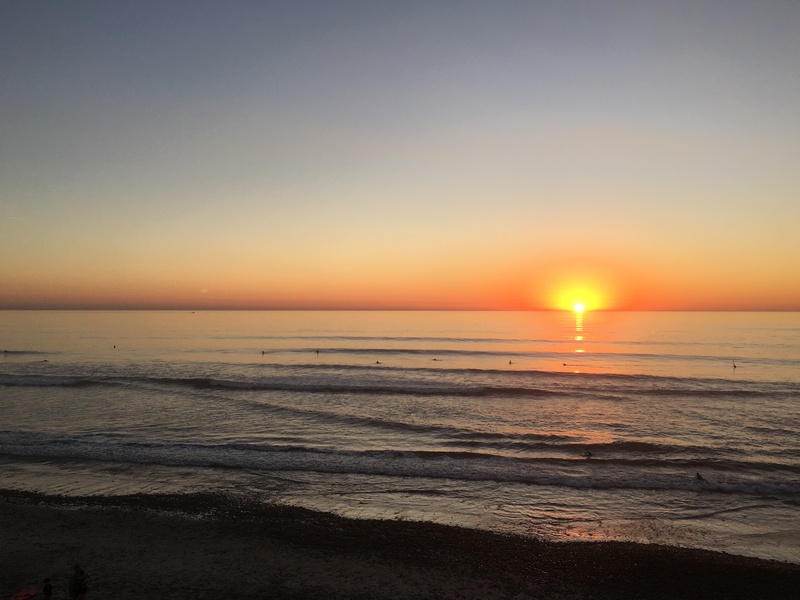 Of course, as a surfer, no visit to the San Diego coast is complete without some beach time. So, in between meetings and a little computer time, I’ve been managing to catch more than a few waves at some really special places with minimal crowds and some true locals in the water – the sea life! I can’t tell you how many dolphins, fish, and wonderful birds I’ve seen out there in the line-up, just a few feet (and sometime inches) away from me! What an amazing stretch of the California coastline. Hanging after a solo acoustic performance at Amazon Music HQ in Seattle, WA with some of the team. 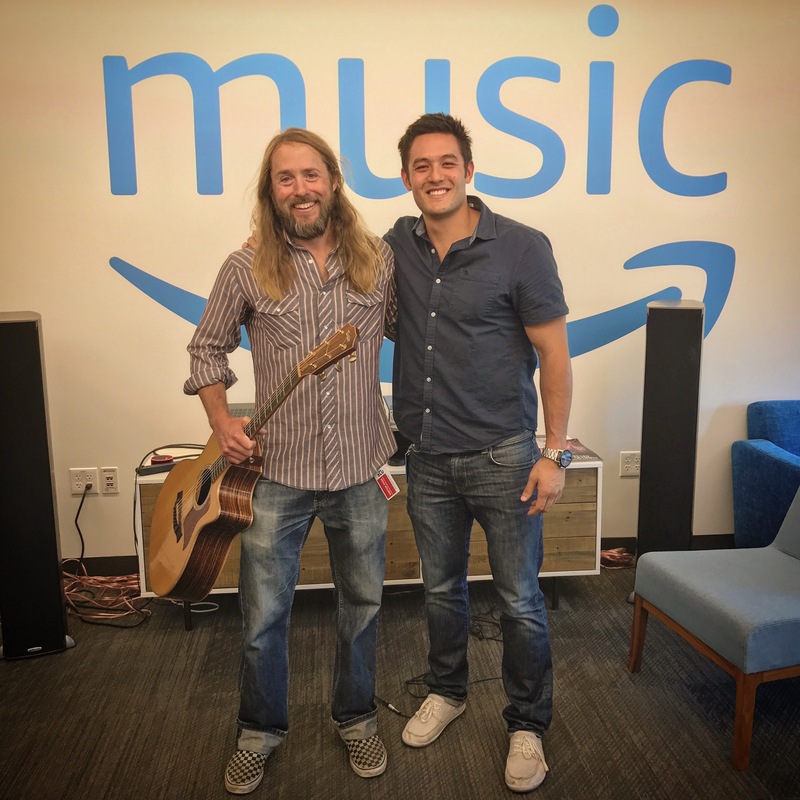 While on tour up in the Pacific Northwest, I was stoked to have the opportunity to perform a solo acoustic set for the team at Amazon Music in their Seattle, Washington headquarters before my evening performance at The Crocodile. What an experience! I previewed some of my new material slated for my upcoming album, produced by Grammy Award winning engineer, Richie Biggs, while sharing some stories, a few laughs, and a few glasses of wine, in between. Be sure to check out my latest release, ‘Let Me In’, on Amazon Music and stay tuned for my new album, scheduled for release in early 2018. New ChiMcClean.com stickers are finally available in both matte and gloss finish. Which will you choose? 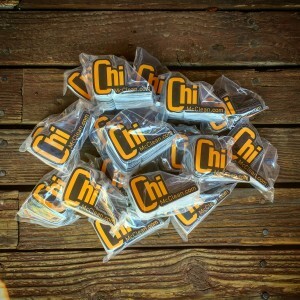 A brand new batch of ChiMcClean.com stickers arrived the other day – this time in gloss AND matte finish! Which will you choose? These are exclusively available at my live performances, so be sure to check my calendar and come out to a show near you to get your free stickers! They’re perfect for water bottles, rooftop gear boxes, insulated coffee mugs, skis, snowboards, truck bumpers and, yes… even foreheads. Seen in the audience at one of my shows. This location is not necessarily advised, but certainlly enjoyed! What a cute kid! It’s a been a long while since I’ve been up to the Pacific Northwest, and I’m so stoked to get back up there to make some music! On Thursday, August 17th, 2017 (today), I’ll be rolling into Seattle, Washington for a meeting, then a solo acoustic set at The Crocodile, sharing the bill with my pals, Will Champlin and Tim Moyer, from California. 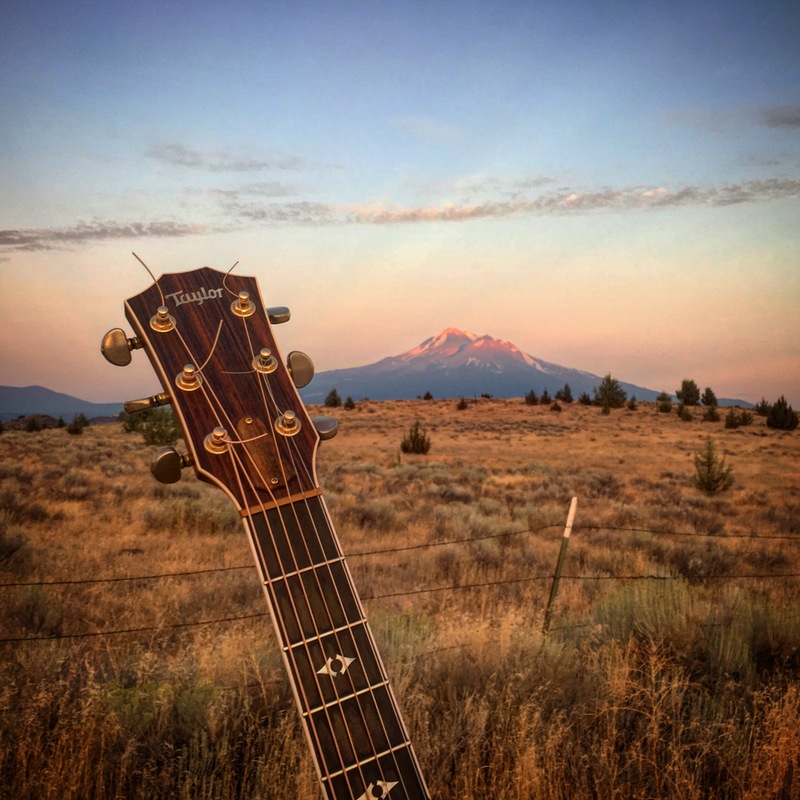 A view of Mount Shasta and my guitar en route to play The Crocodile on Thursday, August 17th in Seattle, WA. Despite a few hiccups on the drive (like an unexpected $1,000+ repair to the van), it’s been an amazing trip! 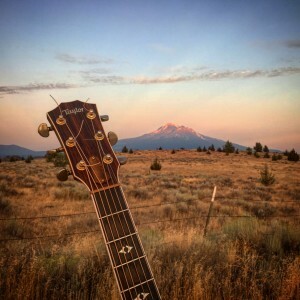 I’ve seen some pretty awesome views including the one above of Mount Shasta, and even stepped out a few times to break from the drive and pick some tunes. I also made a pitstop in Bend, Oregon to visit an old pal for some insane, single track mountain biking, burgers, and craft brews. Fueled by coffee, gluten-free breakfast sandwiches, and memories of some killer views and times on the road over the last few days, I’m closing in on Seattle this morning and am stoked to play this evening! If you haven’t picked up your tickets yet for tonight’s show, there’s still time! Just visit the ticket link and click away! Please note that this performance is 21+ ONLY. 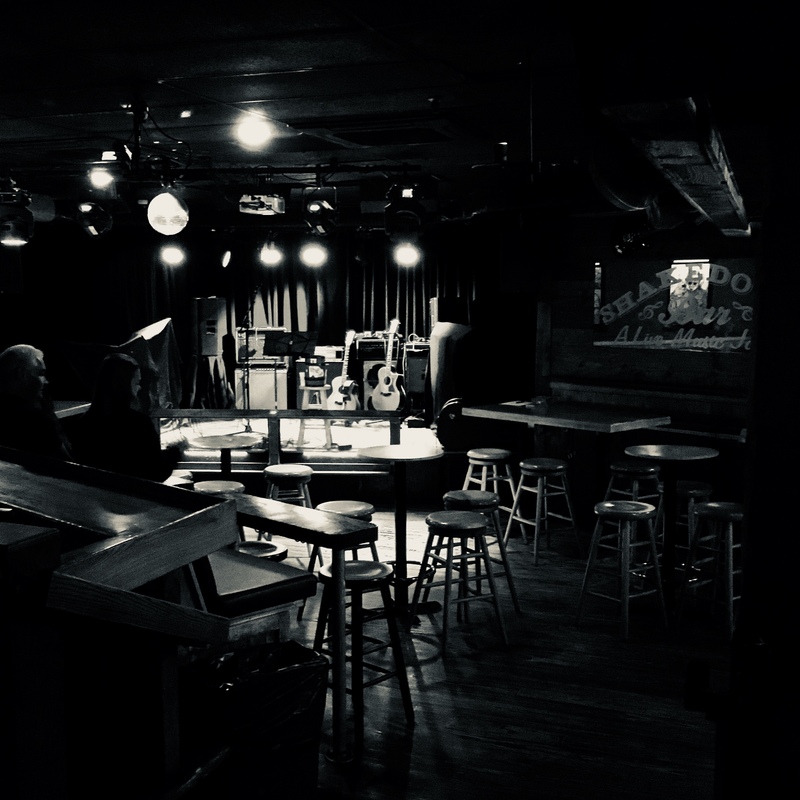 Doors open at 7:00 PM and music kicks off promptly at 8:00 PM with yours truly on first, so be sure to arrive early to grab the best spot to listen and watch. It’s gonna be an awesome evening of live, original, roots music in Seattle, Washington, so grab your tickets, spread the word to your friends, and c’mon over to say “hi” and hang for an early start to the weekend. See ya soon Seattle! After a long, red-eye flight back from California to Tennessee (when doesn’t a red-eye flight actually seem long?! ), I’ve been getting settled back into the swing of things here in Nashville. Other than the typical errands and busy work that needs handling after being away (checking old mail, etc. ), I swung into Frothy Monkey HQ to pay a visit to my friends at Taylor Guitars who were putting on a little meet and greet and kick-off to The Summer NAMM Show. It was a hoot to check out some of their latest acoustic guitars, meet some other endorsing artists in and around Nashville, and drink some awesome coffee – especially after my overnight trip back to town! 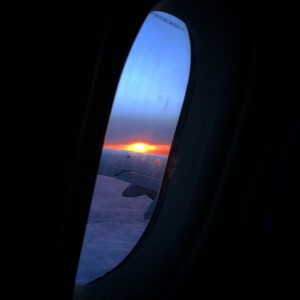 After passing a bunch of wildfires in NV en route to the airport on Monday, it was really nice to see a different kind of fire in the sky, courtesy of United Airlines en route to TN. 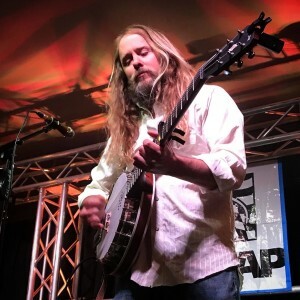 So, I’ll be back for just a short while this time, but it’ll be long enough to take a few meetings at The Summer NAMM Show, write some songs, fix some works-in-progress, and get another day or so in the studio with friend and producer, Richie Biggs, at The Art House. We made a lot of progress together, earlier this June, and while we still have a way to go, we’re definitely chipping away at this project and ticking off the “to-do” list with some more overdubs this week and, perhaps, even some vocals. Can’t wait! 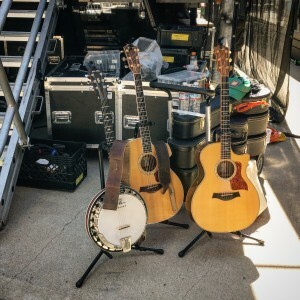 My trustworthy Taylor Guitars 814ce’s and my Deering Banjos Boston Six-String before an outdoor performance this July. Speaking of the album, there’s a new addition to the track listing! I’m so pumped to add a tune I wrote with my pal, Larry McCoy, titled ‘Name On My Breath’. 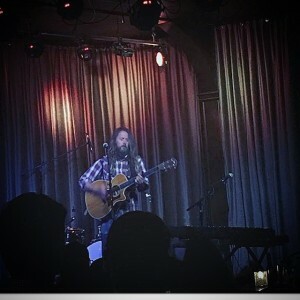 After working through it a bit, I put together a quick video of a live, solo acoustic version done at my friend, Brad Cobb’s, studio in Glendale, California – odark30 studio. As it turns out, Taylor Guitars picked it up for this week’s (Tuesday, July 11th, 2017) #TaylorTuesday episode on their Instagram page. Check it out here! I’ll be working with them to make a few more videos to post during the next several weeks of July into August to tease my upcoming release. So, be sure to follow the Taylor Guitars Instagram page (and the Chi McClean Instagram page, while you’re at it) for updates, each Tuesday, through August 1st, 2017. Thanks so much for your on-going support, friends! See ya soon! 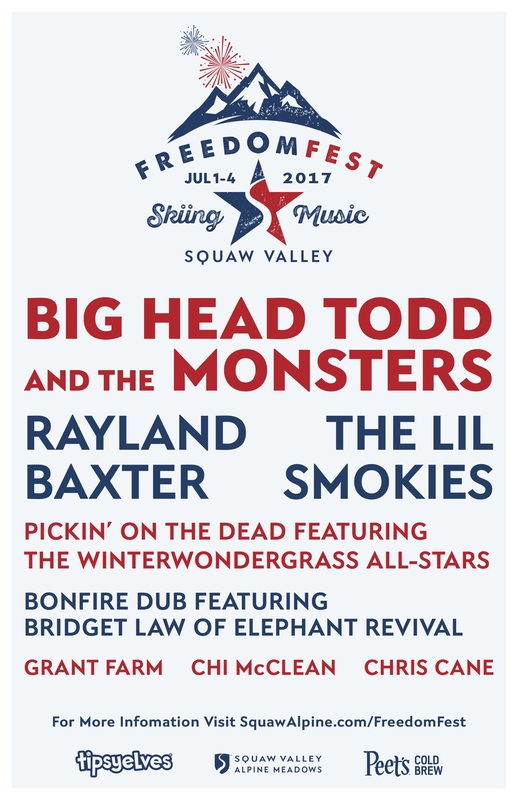 Stoked to play #FreedomFest at Squaw Valley USA this July 1st, 2017 along with a terrific line-up! It’s been a while since I’ve updated this page, but there’s just been so much going on… Still, that’s no excuse! 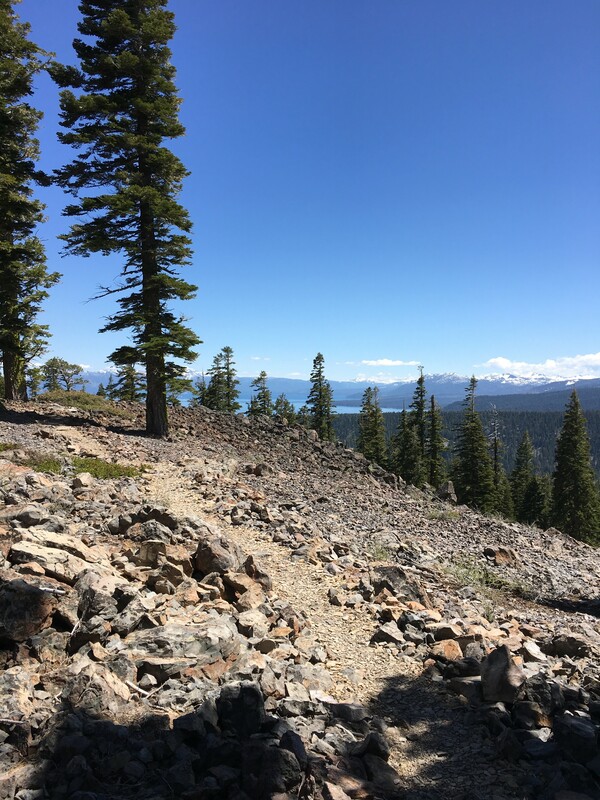 After a great run of shows up and down the California coast in April and May, I spent a little time in North Lake Tahoe, CA before packing up the Outside Van and heading back down to Nashville, TN to co-write a few more tunes with some pals, track some more band songs for the upcoming release, and write a few others on my own to see if I couldn’t beat out anything already slotted for the new project. It was so awesome to get back in the studio at The Art House with Grammy Award-winning producer and engineer, Richie Biggs, and a terrific cast of session players. All told, I have a solid chunk of new tunes under my belt after a few weeks back in Tennesee and three more full-band recordings tracked, too. This new record is definitely coming along and is taking shape nicely – I can’t wait to share it with you all! Meanwhile, it was hotter and more humid than you-know-what down there, and no amount of hot chicken, BBQ, sweet tea, or otherwise could make up for it! So, as productive and fun as it was being back in Nashville, even the four-day drive back to some long gigs in Northern California couldn’t keep me from wanting to get into a some drier and cooler surroundings (let’s face it, #vanlife in the South is brutal in the summer months without air conditioning). So, after a marathon drive over the last few days, I made the final stretch from Salt Lake City, UT to Clio, CA after about nine hours, just in time to load in, sound check, and play my gig. 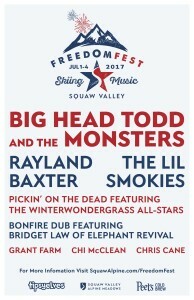 It was so great to be back in the mountains, doing my thing, and I can’t wait for a few more dates this July 4th weekend at Squaw Valley USA for #FreedomFest and more. It was so hot doing the #vanlife thing in Nashville, TN! I’m glad to be back to some cooler and drier weather in NorCal. As always, keep your eyes peeled for my upcoming performance dates and come on out and say “hi”, if you’re near! If you don’t see anything on the calendar near you, just let me know via my contact form and I’ll do my best to come to you! In the mean time, here’s to a fun, safe, and patriotic Independence Day Weekend and a wonderful summer to follow! See you out there soon, friends! 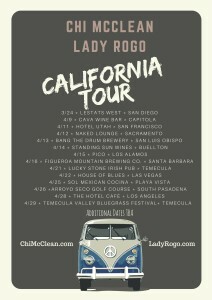 I am so fired up to hit the road with my friend and touring partner, Lady Rogo, this April 2017! Starting on Sunday, April 9th, we’ve got a really fun run of dates lined up that will take us as far north as San Francisco and Sacramento to points as far south as Los Angeles and San Diego, over the course of three weeks. I’ll be featuring my favorite material from my first two albums and my 2016 release, Let Me In, and will also be sharing some new songs slated for my upcoming 2017 release, produced by Richie Biggs, back in Nashville, Tennessee. 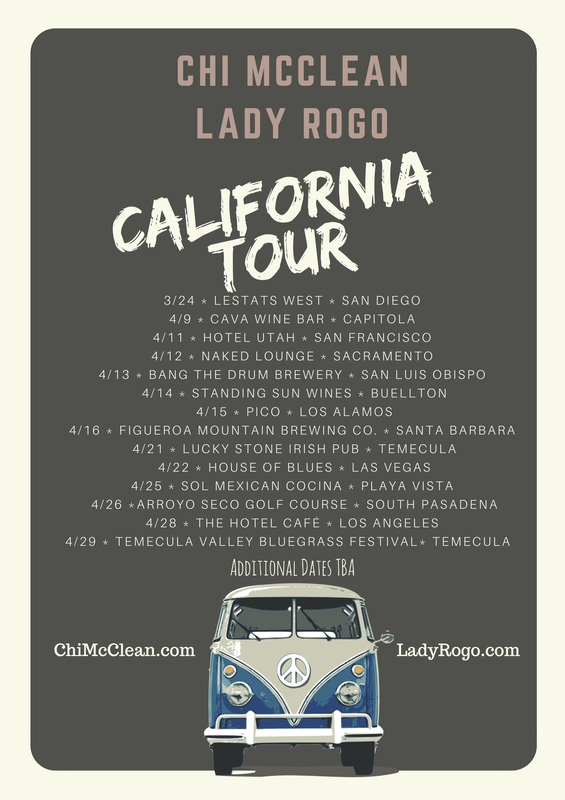 Lady Rogo will be showcasing songs from her debut record, I Will Give, while highlighting some brand new songs scheduled for her upcoming, second album. We’ll also be collaborating here and there on some tunes in between with a couple fun surprises to come, so take note of our current tour dates and don’t miss an opportunity to catch the fun when we swing through your neck of the woods! More performances are being added daily, so for the most up to date information, be sure to check out the tour calendar here or visit my Facebook, Twitter or Instagram feeds for daily updates, new show announcements, ticket information, and more as we get closer to the start of the tour. We still have some available dates that we are hoping to fill, along with some daytime opportunities for performances in between our existing dates, so if you’d like us to swing through your neck of the woods, or if you’d like to host a house concert or intimate, listening-room performance in your venue, please give us a shout and let’s make it happen! 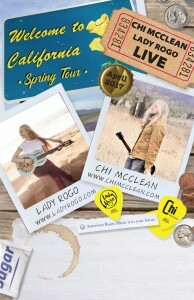 See you soon, California! 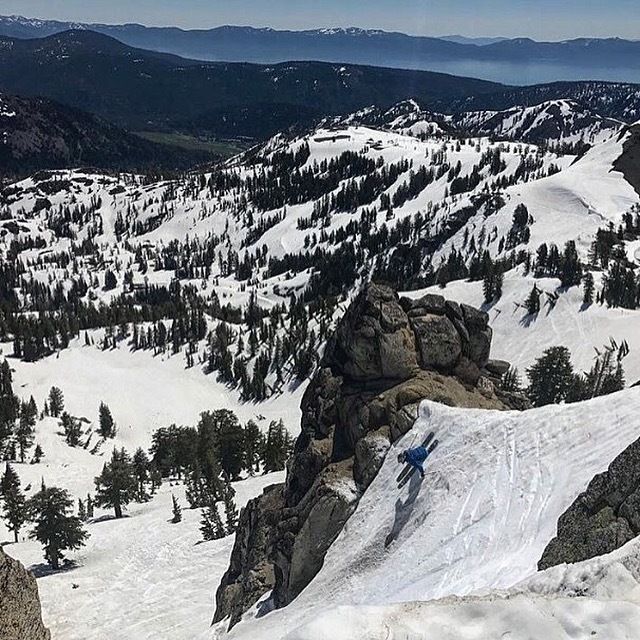 After a busy but wonderful holiday season, I’ve found myself back in one of my favorite parts of the world – Lake Tahoe, California. It’s been such a nice change of pace from Nashville, Tennessee and it’s felt so good to get back into a regular performance routine. 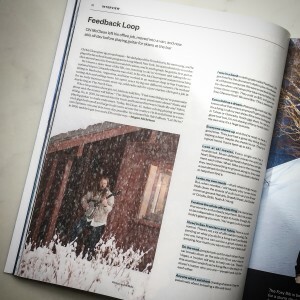 Plus, the skiing and winter vibes have been amazing this year! I’ll be performing at a variety of spots around North Lake Tahoe for the next few months while (hopefully) replenishing the bank account after working on my fourth record this past November and December 2016 with producer and engineer, Richie Biggs. In between, I’ll be making the occasional trip up and down the coast for some performances on the road, like the one I’ll be making down to Anaheim to showcase at The Winter NAMM Show on January 19th and 20th, 2017. All in all, it really feels good to be back here in this magical, winter wonderland. If you plan to be in the area, or if you need a getaway and are wondering what to do and where to go, c’mon out and say hi at one of my upcoming performances this season! I’ll be listing all of my performances on my Shows Page, as well as on my Facebook, Twitter, and Instagram pages. You can also follow me on BandsInTown for the most up to date information on where and when I’ll be performing, regardless of the geographic region.